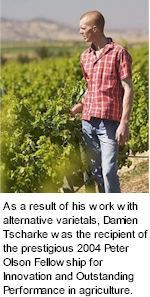 Damien Tscharke was born and raised a sixth generation Barossa winemaker, he grew up amongst the vines at Seppeltsfield while attending Marananga Primary and Nuriootpa High. Gnadenfrei is the oldest vineyard within the Tscharke estate portfolio, established over seventy years ago by Damien Tscharke's grandfather, the terroir and clime yield an exceptional quality of Shiraz. A substantially structured, youthful Barossa style, driven by fruit and kept vital by rich, cherry filled acidity. Grapes are all hand picked and destemmed into open top fermenters, the musts are inoculated and vinified at temperatures between 22°C and 25°C. Active ferments are pumped over twice daily and treated to a course of boots on foot stomping pigeage. Upon completion to sugar dryness, batches are held on skins for a week, extracting optimal colour, flavour and tannin, followed by passage through an airbag press and racking to a mix of new and seasoned French oak. Gnadenfrei is bottled after a term of extended maturation, finished to a style aimed at retaining vibrancy and primary fruit freshness, nineteen months after harvest. Crimson red, deeply coloured to the core. Bright and lifted bouquet revealing black fruits and plum, dark chocolate, figs and dates, liquorice and cola. Driven by intense fruit, persistent flavours of dark berries and plum, cherries, liquorice and spice. A refreshing, full bodied Shiraz of great length, vanillin oak and chocolatey tannins to the finish, Tscharke drinks very well in its youth.